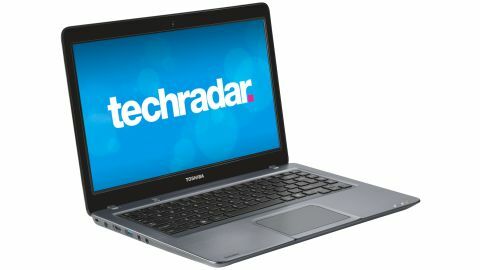 The Toshiba U840-10V comes in at the lower end of the price scale for Ultrabooks. Available online for around £650 (around AU$998/US$1,034), it beats the price of the likes of the Asus Zenbook UX31 by a couple of hundred pounds, and the likes of the Samsung Series 9 by enough to buy a whole second laptop. But Toshiba hasn't skimped on the laptop's specs, considering the low price. There's an Intel Core i5 processor, 6GB of RAM and a 14-inch screen, for example. The flip side is that there's little here that's unique, or that even makes it particularly stand out over its competitors. It's all about fitting the machine to the price, which is fine by us. So while you get 500GB of storage, it's a hard drive, rather than an SSD. Yes, you get 6GB of RAM, but not Intel's top-of-the-line processor (though it is still an Ivy Bridge model). You get a 14-inch screen, but it's not flashy 1080p. At 19.9mm (0.78 inches) thick and 1.58kg (3.48lbs), the Ultrabook is also noticeably thicker and heavier than the likes of the MacBook Air 13-inch. When you consider the extra size the 14-inch screen adds, it does come across as less portable than the high-end Ultrabooks, but it's still far lighter and smaller than your average budget home or work laptop (and a huge amount easier to carry than something like a gaming laptop). The design of the Satellite U840-10V is simple, but generally nice. It's got a brushed-slate finished, and wouldn't look out of place in the average office. There's a black plastic lip at the point where you lift the lid for some reason - perhaps to avoid fingerprints? The Toshiba logo on top feels extremely cheap, but it's the only outward sign that this laptop is targeted more towards the budget end of the spectrum (for Ultrabooks). Inside, the brushed slate continues across the lower half, while the screen bezel is glossy black. It's adorned with the usual collection of brand stickers (sigh), and a glowing power button at the top. The keyboard is backlit, which is great to see at this price.